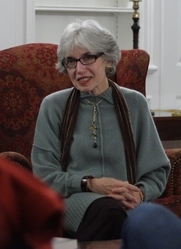 Dava Sobel is the author of Longitude and Galileo's Daughter. Her latest work is A More Perfect Heaven: How Copernicus Revolutionized the Cosmos, published by Walker & Company. You've done something quite unconventional with this book, putting a two-act play right in the center. How did this idea come about? My original idea was to write the play. Well into that process—after I'd written and re-written the play several times—my editor, George Gibson, suggested writing a book around the play. I had already accumulated a cache of background information through my research, and he urged me to put that to use. The process of writing the nonfiction narrative produced many good effects: I stopped worrying about what Copernicus might say to me for putting words in his mouth. Also I was able to re-write the play yet again, with a new-found freedom to let the characters rip. What was it about the idea of a play that drew you to use a dramatic recreation, rather than some other method, to recreate the collaboration between Copernicus and Rheticus? Since February 1973, when I first learned of their meeting, I have wanted to write a play that would imagine their conversation—how Rheticus convinced Copernicus to do what he'd avoided doing for a lifetime (i.e. publish his book). Everyone knows their meeting took place, but no one knows what they said to each other. The situation seemed ripe for imagination. Did you find it more difficult to write the play than the narrative chapters? Or did that part of the process come naturally? The play was definitely the more difficult part. The dialogue of a play is not at all like ordinary conversation, and I had much to learn as a novice playwright. Narrative nonfiction, on the other hand, does come naturally to me as I've been a reporter since 1970. Has the play been performed on stage yet? If not, will it be? It has had staged readings, but not a real performance. I'm working toward that end now! For those who might not have had the chance to read the book yet, tell us what it was about the Copernicus/Rheticus meeting that's so important. Their meeting pushed Copernicus to release the book he'd been writing for thirty years. They were an unlikely pair, the old man and the young, one Catholic and the other Lutheran—at the height of the Protestant Reformation—from different countries with different agendas, yet they united over the idea of an alternate universe. The book that got published as a result of their collaboration really did change the world. Have you had the opportunity to see many copies of Copernicus' De revolutionibus? Do you have a favorite copy yet? I have seen only six or seven copies—not enough to declare one a favorite. There's a small society (only three members, so far as I know) of people who have seen one-hundred-plus. I aspire to membership someday. I saw an interview in which you described the situation you think led you to become a science writer, rather than a scientist. Can you share that what us? You must be referring to the New York City blackout of 1965, when my biology lab partner and I were dissecting a fetal pig on the City College campus. Another day that semester, I passed the comparative anatomy lab and saw a lone individual laboring over a dead shark. My feelings convinced me I could never be a bench scientist as my mother had been, or a medical doctor following my father. Unfortunately, I didn't yet know how to unite my love of writing with my interest in science. In fact, I didn't even hear the term "science writer" until years later, after I started working as a newspaper reporter. Tell us about your writing process. Any quirky rituals or habits to share? I do like to get up very early in the morning, around 4. I just think better at that hour. I don't really have any quirky rituals or habits, but each project makes its own demands. For Galileo's Daughter, before I started translating the letters, I copied them all out longhand into a notebook, so I could experience what it felt like to have expressed those thoughts in writing. What books have you enjoyed reading recently? What are you reading now? I enjoyed reviewing Measure of the Earth by Larrie D. Ferreiro, about the French expedition to Peru to determine the extent of a degree of latitude at the equator—and thereby deduce the shape of the planet. I also recently read with pleasure Toby Lester's The Fourth Part of the World, about the first map to give America its name. I have a wonderful novel with me on my current travels—Tinkers by Paul Harding—but, alas, no time to read. I plan to write about the women who served as human computers at the Harvard College Observatory in the late 1800s and early 1900s. The director, Edward Pickering, hired them because he deemed women more careful than men, and assumed they would work for lower pay. "Pickering's Harem" as they were called, though they hated that epithet, excelled in their jobs, and several went on to truly extraordinary careers in astronomy. One became the first female professor at Harvard, another the first female director of an independent observatory. From this same group of women came the classification system for stars and the scale for measuring distances to other galaxies.